The world is full of evil people. Samoa is certainly not immune. It goes without saying therefore that where goodwill exists, there is also deceit and fraud lurking around the corner. They will strike when people are vulnerable, especially in the pursuit for material wealth. Last Sunday, a story titled “Alleged conman alert” was published on the front page of the Sunday Samoan. With the idea of warning unsuspecting members of the public to beware about the movements of a certain individual, the headline naturally aroused interest and worry. You see, in these challenging times, the last thing we want is another person to become a victim of such a ruthless person. So we highlighted Taupaūape Losa Moafanua’s story to make a point. We wanted to remind once again that there are some very, very bad people among us. Taupaūape by the way was allegedly conned by a man named “Soloi,” also known as “Faleti Fiti.” He fleeced her of cash with a promise of a piece of land at Vaitoloa. It’s an interesting story with a sad twist. Listen. “This all started last month when this man came to where I work and asked if I wanted to buy ¼ acre of land at Vaitoloa,” she explained. “I asked him how much the fee is and he said it’s $2,700. He said his lawyer is giving him until Friday of that week to pay her fee otherwise she will use his land to pay for her fee. The man is persistent. The next day, he was at her office again. This time he asked her for $800 tala to pay off the lawyer’s bill. To cut a long story short, the man has now run off with her money and is nowhere to be found. Now Taupaūape is left heartbroken – and literally broke. “I mean I trusted this person so much because of all the evidence that I saw in the selling of this land,” she said. Now this is what gets me. How can you trust someone you don’t even know? Besides, don’t we live in an age where anyone can produce documents that seem legitimate if they have the right equipment? How many fake degrees and qualifications are floating around out there for example? Sadly for this woman, she has obviously learnt her lesson and she wants to warn everyone. Well the warning came a little late. You see the conman had already fooled another victim in the form of Eti Sapolu, of Fa’atoia and Lalovaea, who was conned of $10,000. 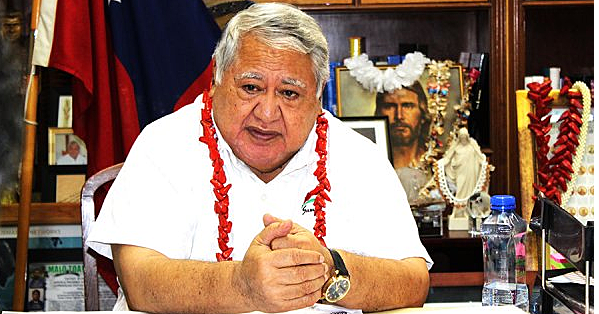 Days later, Mr. Sapolu said Faleti asked him for another $5,000. He apparently insisted there was another buyer interested in the land. Like Taupaūape, Mr. Sapolu lodged a complaint with the Police. “But the Police told me that I can’t file a complaint because Faleti had already given a statement saying that the $10,000 was a gift for him from me,” he said. Again, this doesn’t make sense at all. When Taupaūape lodged the complaint with the Police, she was told that this man has been jailed several times for the same offense. Wind the clock back a few years, they told Mr. Sapolu that the conman had apparently beaten him to the Police with a statement claiming the money was a gift. This has got to be one of most bizarre twists ever in this story. Why would a conman suddenly make a statement to the Police that he received a gift? Aren’t statements reserved for victims? How can someone who received a gift be a victim? Back to the woman, if the Police knew that this man is a notorious fraudster, what is he doing mingling in the community? Why haven’t members of the public being warned? Why do we get the feeling that perhaps this conman is well connected? Something doesn’t add up about these stories and what that is we cannot put a finger on it at this moment. What we want to say is that from where we stand, both cases could have easily been resolved with the use of common sense. Common sense tells you don’t just blindly trust strangers especially smooth talking ones walking around Apia with some documents. Common sense will always tell you to check first and be absolutely sure before you commit to anything. Common sense will tell you that five acres at Vaitoloa is not just going to cost $5,000. Common sense and your first impressions will always warn you about someone. What has happened to these members of the public is sad. But we have to always remember that if it’s too good to be true, then it probably is. Have a peaceful Sunday Samoan, God bless!